Endoscopy is a minimally invasive way to evaluate the inside of organs such as the esophagus, stomach, intestines, urinary system, trachea, lungs, and nasal cavity. Additionally, endoscopy can be performed to evaluate the inside of body cavities including the abdomen (laparoscopy) or chest (thoracoscopy). During endoscopy, an endoscope is inserted directly into an organ through a natural opening in the body or into a body cavity through one or more small incisions. 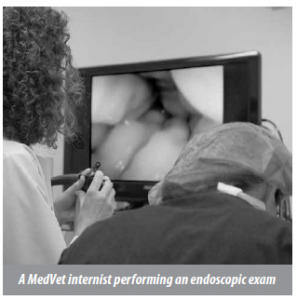 An endoscope is a medical instrument that has a camera, microchip and light source at the tip, permitting transmission of a high quality image to a computer monitor for your pet’s doctor to view and interpret the condition of the area being examined. In veterinary medicine, endoscopy of the gastrointestinal (GI) tract is most common. We can perform endoscopy of the upper gastrointestinal tract (UGI), which includes evaluation of the esophagus, stomach, and duodenum. We are also able to evaluate the colon, cecum, and ileum through endoscopy of the lower gastrointestinal tract (LGI). Why Endoscopy of the Gastrointestinal Tract in a Dog or Cat? Your family veterinarian, working with MedVet’s internal medicine doctors, may recommend endoscopy of the gastrointestinal tract for evaluation of clinical signs such as vomiting, diarrhea, problems swallowing, or unexplained weight loss, or for removal of foreign material that your pet may have eaten. During endoscopy, the internal medicine doctor will be able to biopsy both normal and abnormal appearing tissue without performing surgery. The results of the biopsies may take a few days to return. However, your internist can frequently make an assessment as to the underlying disease process and make preliminary recommendations to help your pet based on the appearance of the inside of the organs as seen on the images provided. Once the biopsy results return, we can often determine a final diagnosis and treatment plan to make your pet feel better. Endoscopy can also be used for noninvasive removal of foreign material that your pet may have eaten. What is Involved in the Endoscopy Procedure? All pets undergoing endoscopy are placed under general anesthesia for their safety and comfort. It is also important that the procedures are performed after your pet has fasted. This is imperative for both safe anesthesia and also to ensure the most information is gained during endoscopy procedure. The duration of the fast will be discussed prior to the procedure. A minimum of twelve hours is most often required. Your MedVet doctor will discuss what medications should or should not be given prior to endoscopy. Is Hospitalization Required for this Procedure? Most procedures can be performed the day of your visit. Your pet will probably be able to go home with you later the same evening. In some instances, such as endoscopy of the lower gastrointestinal tract, one night in the hospital may be needed to prepare the colon for the procedure. Patients that are at high risk, or those that are already hospitalized, may need to stay longer for their safety and well-being. What Should we Expect After the Endoscopy Procedure? In most instances, your pet will have a rapid and full recovery once the anesthetic agent is out of their system. Once the results of the endoscopy are obtained, your internist will communicate directly with you and your family veterinarian regarding additional treatment requirements and follow-up. In many circumstances, your family veterinarian will be able to resume care with input from MedVet’s internal medicine doctors as needed. What are the Risks of Endoscopy of the Gastrointestinal Tract? In general, endoscopy is a very safe procedure. However, complications can arise as a result of anesthesia, tear in the gastrointestinal tract, or an inability to remove foreign material due to size or shape of the object(s) eaten. The specific risks of complications vary from individual to individual based on blood work changes, overall clinical condition, and expected disease process. Prior to the procedure, all possible complications will be discussed with you in detail. When can Endoscopy of the Gastrointestinal Tract be Helpful? What are the Benefits of Endoscopy of the Gastrointestinal Tract?